Shenzhou is a Spacecraft that was developed and is operated by the People’s Republic of China and is desgined for human Space Flight. Shenzhou means Divine Craft. It is based on the Russian Soyuz vehicle, however, it is larger in size and uses all-new construction and materials. The Spacecraft made its maiden voyage in 1999 and performed its first manned mission in 2003 making Yang Liwei the first Taikonaut to orbit Earth. Shenzhou Spacecraft are launched aboard Long March 2F Vehicles that are based on the CZ-2E Rocket, but feature a launch escape system and go through a different quality control process. CZ-2F launches from the Jiquan Satellite Launch Center. Mission Control for Shenzhou Missions is the Beijing Aerospace Command and Control Center. 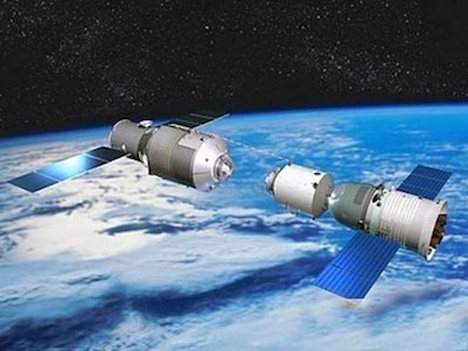 The Shenzhou Spacecraft consists of three sections – similar to the Russian Soyuz Vehicle it is based on: the Orbital Module, Instrumentation Module and Entry Module between the other two sections. 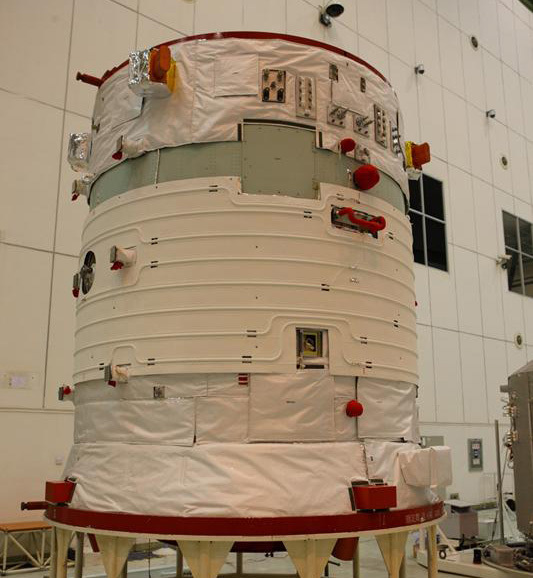 The Instrumentation or Service Module is located underneath the other two modules and houses equipment necessary to support the vehicle during its mission. It has a liftoff mass of 3,000 Kilograms, is 2.94 meters in length and 2.5 meters in diameter. The SM provides the electrical power, attitude, control and propulsion for the spacecraft in orbit. Several ellipsoid-shaped compartments house the avionics of the vehicle. The module features two solar arrays that are deployed after orbital insertion and silver-zinc batteries that form the electrical system of the spacecraft. The arrays consist of four sections each and provide a total surface area of 24.48 square meters. They provide about 1000 Watts of average power to the spacecraft. The solar arrays can be rotated to automatically track the Sun using a sensor system. The vehicle operates on a 28-Volt power bus and the batteries can provide emergency power for up to six hours. The main propulsion system of the Shenzhou vehicle is also located in the aft Service Module. It consists of four main engines each providing 2,500 Newtons of Thrust. These are used for orbit adjust burns and the deorbit of the vehicle. A typical Shenzhou deorbit burn is rather short with a duration of 75 seconds using all four engines. The four engines provide a redundant system as the vehicle could make its deorbit burn with only one good unit. The SM Main Propulsion System and Reaction Control System are unified – both systems use Monomethylhydrazine as fuel and Nitrogen Tetroxide as oxidizer. Four tanks can hold up to 1,000 kilograms of these propellants. The Service Module Reaction Control System consists of eight 150-Newton high-thrust pitch and yaw jets, eight low-thrust (5N) pitch and yaw jets as well as eight 5-Newton low-thrust engines for roll control mounted at the center of gravity. The orbital module and entry modules also have Reaction Control Systems that are available for use. The Entry Module is located between the two other sections and is 2.50 meters long and 2.52 meters in diameter. It has a total mass of 3,240 Kilograms and offers 6m³ of habitable volume. The Entry module houses vehicle control systems and crew seats. The crew is isolated in the Entry Module for launch and landing. Its structure consists of a titanium frame and aluminum alloy sidewalls, base and pressure vessel. It features a 0.7.meter hatch that separates it from the orbital module. The crew accommodations of the Entry module are derived from the Soyuz with three custom-made seat-liners for the crew that are equipped with shock-absorbing systems. Crews also wear Launch and Entry Suits that are very similar to Russian Sokol Suits. The Entry Module houses the Central Terminal Unit – the triple redundant and majority-voting flight computer of the Shenzhou Spacecraft. This unit controls all aspects of the flight – including ascent, orbital flight and re-entry as well as the landing process. More avionics boxes are installed under the crew seats that are used for data recording and communications between the three modules. The entry module’s emergency data recorder was built so withstand 10,000 G’s and a temperature of 1,200°C providing 10MB of solid-state memory. Shenzhou’s sophisticated communications system utilizes C, S, L, UHF, VHF, and HF band frequencies. For voice and telemetry up- and downlink, the S-Band System of the vehicle is used while C-Band is used for a single-pulse radar transponder, telemetry equipment and antennae. The VHF-System can be used as backup voice communications system and the HF transceiver of the vehicle is used to transmit GPS data received by the GPS Navigation System. Also, the Entry Module features several emergency beacons becoming active during entry and landing. 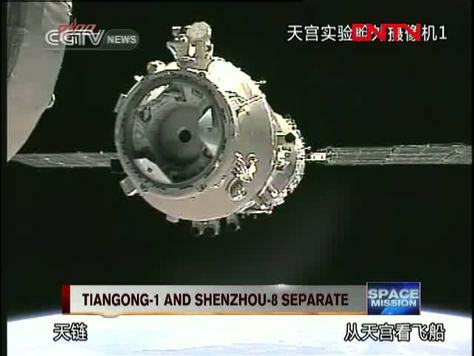 Shenzhou can communicate via satellites and ground stations. 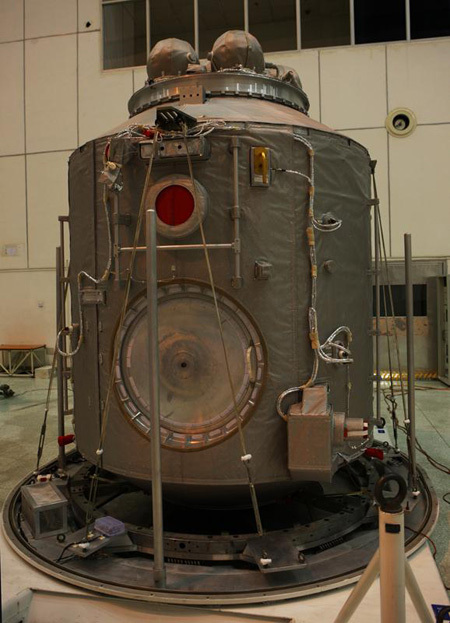 The life support system of the module includes gas tanks to keep the module at proper flight pressure and a heat rejection system to keep the internal temperature at 17 to 25°C during orbital flight and under 40°C during entry. Vehicle Control after module separation is accomplished with the entry module’s Attitude Control System. Eight 150-Newton Thrusters are mounted on the module using Hydrazine as propellant. Two tanks contain 28 Kilograms of Hydrazine and are pressurized by two high-pressure gas tanks. The vehicle’s guidance system uses digital and analogue sun sensors, infrared horizon sensors, a strapdown inertial measurement unit, and a global positioning system receiver. All these sensors provide information to the digital flight control system that is operating the vehicle automatically. Chinese flight software is used aboard the vehicle. The computers constantly monitor attitude, velocity and altitude to target a landing ellipse 30 km in range and 15 km laterally. The Entry module is equipped with a single-fault tolerant parachute system. 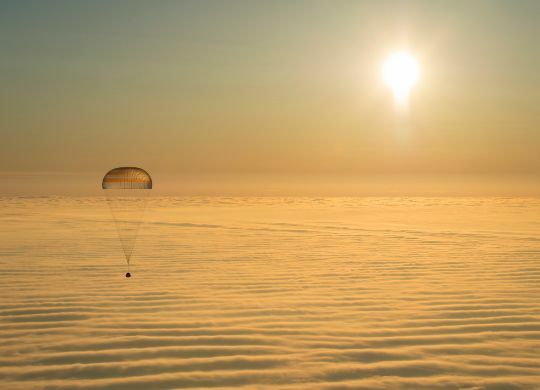 At an altitude of 10 Kilometers, the parachute hatch is jettisoned and the pilot chutes are deployed pulling out the drogue chute that is followed by the main chute that is 1,200 square meters and has a mass of 90 Kilograms. The main chute slows the vehicle down to 8 meters per second as it makes its descent. At an altitude of 6 Kilometers, the Entry Module’s heat shield is jettisoned exposing an altimeter device and soft-landing engines. The altimeter is used to provide altitude and rate of descent information to the flight computers during the final minutes of the landing sequence. Six solid rocket engines ignite 1 meter above the ground to reduce the vehicle’s velocity to its touchdown speed of 3.5 meters per second. Shock absorbers in the seats of the crew provide further cushioning. A ground impact without the SRMs is considered to be survivable in any scenario. The Entry Module is loaded with emergency equipment should landing occur in terrain that is unreachable for initial recovery forces. Inside the module are food provisions and clothing for the crew as well as smoke generators, signal rockets and dye markers as well as an emergency raft for a water landing. 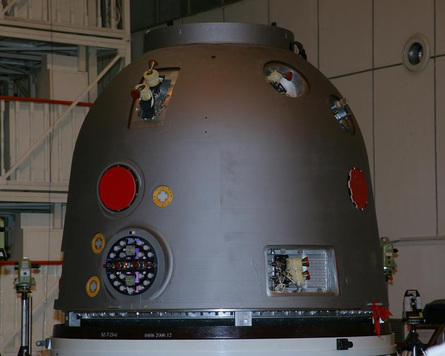 The Orbital Module of the Shenzhou vehicle is located above the Entry Module and houses crew quarters, life support systems as well as mission specific items. It is a semi-monocoque aluminum structure that is cylindrical in shape. Early modules were outfitted with solar arrays as they continued to operate in orbit once the primary mission of the Shenzhou vehicle was complete. 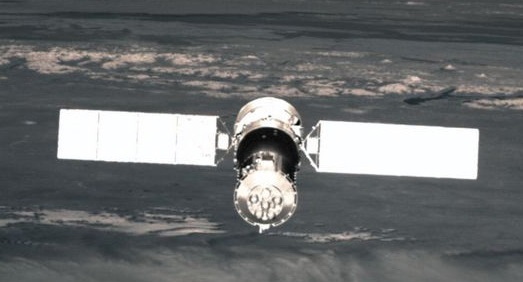 Unlike the other two modules, the Orbital Section has a design life of 200 days and was left in Earth Orbit on early Shenzhou flights for various purposes. For that, the original Orbital Module featured two solar arrays for power generation as well as an autonomous flight control system. The current version of the Module does not include Solar Arrays. It is outfitted with a dual-redundant Central Terminal Unit similar to that of the Entry Module. It can assume its role should the Entry Module’s unit fail during the flight and was also used for autonomous Orbital Module Missions earlier in the program. Four groups of four 5-Newton Hydrazine Thrusters can be mounted on the module for backup attitude control. At the top of the module is the Docking System of the Shenzhou Vehicle. It consists of a Russian-designed APAS System and state of the art navigation sensors used for Rendezvous. The APAS System was used during the Apollo-Soyuz Test Project and Space Shuttle Missions to the Mir and ISS Space Stations. APAS stands for Androgynous Peripheral Attach System. APAS docking rings can mate with any other APAS Docking ring unlike the traditional probe-and-drogue system that is still used by the Soyuz Spacecraft. For APAS, one docking system is configured as passive unit while the other fulfills the active part. Once a soft-mate is achieved after contact and relative motion between the two spacecraft has dampened out, latches are closed to form a hard-mate between the interfaces. Rendezvous Navigation Data is acquired by a high-tech suite of radar, laser and optical sensors designed to provide range and relative velocity as well as alignment data to the vehicle’s navigation computers. This Rendezvous Navigation system was developed in China and is not used aboard the Russian Soyuz Vehicle. The docking interface also includes connectors for power and data transfers.